King's Guard Dolmen is a Dark Anchor spawn point northwest of Cath Bedraud in northern Glenumbra. 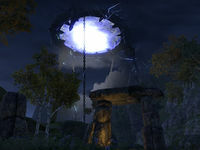 The dolmen cannot be directly accessed from Cath Bedraud, as a mountain range separates the northern coast of Glenumbra from the rest of the region. The dolmen can be accessed on foot by going down the stairs at Merovec's Folly and following the shore, or traveling to Eagle's Brook Wayshrine, heading north through Eagle's Brook, and then following the coast. Alternatively, a one-way shortcut is available: a section of the mountain range located near Lion Guard Redoubt Wayshrine can be jumped over, and one can then descend carefully to the ground and continue north.